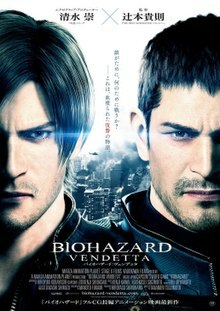 Resident Evil: Vendetta, known as Biohazard: Vendetta (バイオハザード ヴェンデッタ, Baiohazādo Vendetta) in Japan, is a 2017 Japanese 3D-animated biopunk action- horror film which makes part of the Resident Evil franchise, set in the same universe as the associated video games (unlike the live-action films starring Milla Jovovich). The film features the characters Chris Redfield, Leon S. Kennedy, and Rebecca Chambers. It is the third CG movie, after Resident Evil: Degeneration in 2008, followed by Resident Evil: Damnation in 2012, and this film marks the third with Leon as a main character. The film is produced by Marza Animation Planet, written by Makoto Fukami (Psycho-Pass) and directed by Takanori Tsujimoto (The Next Generation: Patlabor, Ultraman X). Takashi Shimizu serves as executive producer. The film was released in Japan on May 27, 2017, while a limited theatrical showing in United Kingdom took place on June 14, 2017 and North America was planned for June 19, 2017. The movie became available in North America across digital retailers on June 20 and on Blu-ray and DVD July 18. The story is set in between the events of Resident Evil 6 and Resident Evil 7: Biohazard. BSAA agent Chris Redfield is tracking Glenn Arias, a Brazilian-American death merchant and a former CIA operative who is wanted by both the Interpol and FBI. Arias is on a mission of vengeance against the U.S. government for killing his friends and family in a drone strike at their wedding. Chris and his fellow agents infiltrate a mansion in Mexico, to rescue their missing undercover source, Cathy White. Inside the mansion, Chris's fellow agents are ambushed by zombies and death traps, with Chris being the sole survivor and barely making it out alive. Chris then comes face-to-face with Arias outside the mansion and is defeated by him in close quarters combat . He then finds out that Cathy has become a zombie under Arias's control. As Arias leaves with his associates, Maria and Diego Gomez, the BSAA rescues Chris by slaughtering Cathy and the remaining zombie horde. Meanwhile, Professor Rebecca Chambers, former S.T.A.R.S. unit member and survivor of the Mansion incident, studies a new virus coined the "Animality Virus"—"A-Virus" for short—that is capable of laying dormant inside any individual until the right trigger is presented. She identifies three components to the virus: the base virus, the trigger virus, and the vaccine. The research labs are soon attacked by Maria, and releases the virus via aerosol form. While her colleagues quickly turn into zombies, Rebecca is able to formulate a vaccine to make herself immune. After fending off some zombies, Rebecca is then rescued by Chris, who briefs her on his mission. Rebecca recognizes the zombies' loyalty to the host and makes a connection to Las Plagas, the bioweapon used by the Los Illuminados who Leon once encountered in Europe, and theorizes that the remaining members of the cult are providing information to Arias in developing the A-Virus. Both make contact with DSO agent Leon S. Kennedy in Colorado. Chris and Rebecca try to get a guilt-ridden Leon on board the mission, but the trio is soon attacked by Maria and Diego. They succeed in capturing Rebecca, while Chris and Leon, who finally agrees to help to finish the mission once and for all, team up to plan a rescue operation and decrypt Arias's plan of a large-scale attack on New York City . Arias intends to make Rebecca his bride as she shares a striking resemblance to his late wife. It is also revealed here that Diego and Maria are father and daughter, and close friends of Arias who also survived the wedding massacre. He develops a new strain of the A-Virus and injects it into Rebecca. Arias then challenges Chris to rescue Rebecca within twenty minutes, after which the virus will take full effect on Rebecca. As Arias's associates initiate their attack on New York City by releasing the virus-laden gas via tankers, Leon and Chris's new BSAA team—D.C., Damian, and Nadia—manage to destroy the vehicles, contain the virus and incapacitate Maria in the process, although Damian is brutally decapitated by zombie dogs in the process. Chris, later joined by Leon, then infiltrates Arias's safe house, defeats Diego and rescues Rebecca. On the terrace, Chris engages Arias in close-quarter combat and throws Arias through the glass terrace below to his demise. Diego then arrives and, despite being badly injured after being defeated by Chris, merges with Arias to form a new Tyrant monster. Chris is no match against the Tyrant until Leon joins the fight after working his way through the safehouse, mowing down zombies. With the assistance of D.C. and Nadia, they manage to trap the Tyrant, at which point Chris finishes it off with a grenade launcher. They are then able to locate the antidote that Arias kept and successfully cure Rebecca before escaping by helicopter, wondering what may lie ahead. The epilogue features Maria being alive and vowing vengeance for her father's and Arias's deaths. Capcom has stated that despite being called a reboot, it is still actually just a sequel. They were actually referring to the film's new tone. The first trailer was released during the Tokyo Game Show on September 17, 2016, along with new footage of Resident Evil 7: Biohazard, the latest numbered title in the main gaming series. Resident Evil: Vendetta was released in Japanese theaters on May 27, 2017. Fathom Events held a special one-night showing of the film across select theaters in North America on June 19, 2017. The movie became available in North America across digital retailers on June 20 and on Ultra HD Blu-ray, Blu-ray and DVD July 18. At the box office, Resident Evil: Vendetta grossed ¥150 million ($1.35 million) in Japan, and $256,320 overseas, for a worldwide total of $1.6 million. On home video, the film earned $1.46 million from DVD and Blu-ray sales in the United States. On Rotten Tomatoes, the film holds a 43% rating from seven critics, with an average score of 5.4 out of 10. IGN rated the film 4.5 out of 10 stars. ^ Mislang, Juphet (September 6, 2016). "Resident Evil 4 Release: Matt Mercer Not Returning as Leon in Seventh Title; When Is He Coming Back?". Bitbag. Retrieved December 4, 2016. ^ "MARZA ANIMATION PLANET NAMES THE NEXT RESIDENT EVIL CGI MOVIE". Marza Animation Planet Website. March 25, 2016. Retrieved December 4, 2016. ^ a b "Resident Evil: Vendetta CG Film Teased in Promotional Video". Anime News Network. September 18, 2016. Retrieved September 20, 2016. ^ "Resident Evil: Vendetta". May 27, 2017 – via www.imdb.com. ^ Macy, Seth (March 20, 2017). "Resident Evil Vendetta coming to theaters". IGN. Retrieved March 21, 2017. ^ a b Macy, Seth G. (March 20, 2017). "Resident Evil: Vendetta Coming to Theaters". ^ "More Resident Evil Movies Planned By Series Creator Capcom". November 8, 2016. Archived from the original on July 29, 2017. ^ Gelmini, David (March 28, 2016). "Third CGI Resident Evil Film to Be Subtitled Vendetta; First Poster and New Details Emerge". Dread Central. Retrieved December 4, 2016. ^ Romano, Sal (August 31, 2016). "Capcom announces TGS 2016 stage schedule [Update]". Gematsu. Retrieved December 4, 2016. ^ "CG Animated Film Resident Evil: Vendetta to Premiere Worldwide, Including North American Event on June 19". /Film. March 20, 2017. Retrieved April 13, 2017. ^ "2018年3月下旬 映画業界決算特別号". Kinema Junpo: 51. March 2018. ^ "Resident Evil: Vendetta". Box Office Mojo. August 13, 2017. Retrieved March 27, 2018. ^ "Resident Evil: Vendetta". The Numbers. Retrieved November 24, 2017. ^ "Resident Evil: Vendetta (2017)". Rotten Tomatoes. Retrieved February 1, 2019. This page was last edited on 31 March 2019, at 22:29 (UTC).